At Medical Plaza 400, patients will enjoy an enhanced patient experience. Clinicians and staff in each office work in concert to offer seamless, comprehensive care across all services and specialties. Our approach is unique; as a patient, you will quickly see the difference. Design elements of the building mimic the renowned design of NGHS’ other locations, such as the North Patient Tower in Gainesville, which has been recognized for its best practice use of natural light, soothing colors and appealing artwork to create a healing environment. The Imaging Center will offer patient amenities such as warm robes, gourmet refreshments and private waiting areas for men and women in a spa-like atmosphere that has earned national recognition at the Center’s Gainesville and Braselton locations. From a clinical perspective, the Imaging Center boasts American College of Radiology (ACR) accreditation for its in-house MRI, CT, ultrasound and mammography services and is also an ACR Breast Center of Excellence. NGPG Dawsonville’s relocation from its current location on Highway 53 gives the practice an opportunity to expand and also develop its cutting-edge medical home model. The Patient Centered Medical Home is a comprehensive model of healthcare delivery that aims to improve the overall quality and efficiency of care provided by primary care physicians. The model focuses on better access to care, greater patient satisfaction and improved clinical outcomes – particularly for chronic conditions. NGPG Dawsonville’s location in Medical Plaza 400 will offer patients convenient access to imaging diagnostics, with same-day appointment availability, and a breadth of physician specialties. Northeast Georgia Health System has cared for residents of the 400 corridor for decades. In addition to local family medicine and outpatient rehabilitation offices, a significant number of this community’s residents seek care in Gainesville at Northeast Georgia Medical Center and the Gainesville Urgent Care and Imaging Center locations. 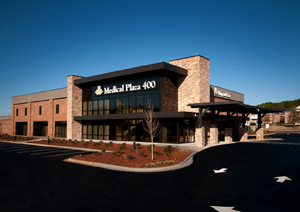 Medical Plaza 400 allows NGHS to bring even more outpatient services and advanced physician specialties closer to home for the residents of this area. NGMC has just received two prestigious awards and is the only hospital in Georgia to be named to either list. HealthGrades® has named NGMC one of America’s 50 Best Hospitals for 2013, and Truven Health Analytics, formerly the healthcare business of Thomson Reuters, has named NGMC a 2013 100 Top Hospitals® award-winner. The America’s 50 Best Hospitals distinction recognized that NGMC had risk-adjusted mortality and complication rates that were among the lowest 5% in the nation for a minimum of seven years. The 100 Top Hospitals award is based on demonstrated top performance and consistent, accelerated improvement across 10 areas including mortality, complications, readmission rates and patient safety.